Find the hidden treasure of a thief who lived 200 years ago. Find the hidden scroll containing a riddle. Solve the riddle, find the hourglass, and you receive your reward. In the bedroom of Rosethorn Hall, in the loft above the stairs, you will find a scroll, called Long Forgotten Note. The scroll provides the clue leading to this quest's treasure. The note is located right against the wall, so you will not be able to see it unless you can jump high enough. Obtaining the note is required for the quest: the treasure is only enabled after you have read the note. Start facing the desk (with your back to the bed). From there jump onto the two bookshelves (if necessary, jumping first onto the chest, then onto the bookshelves). You should then be able to jump to the loft. Try jumping onto the desk, onto the deer head, and then onto the loft. If you have yet not purchased any upgrades, none of the furniture will be available to help you jump up. It is still possible to reach the note, but it requires more skill and good timing. 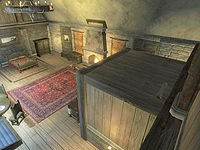 Jump onto the fireplace ledge backwards and then head towards the corner of the ledge and jump. If you have a high enough acrobatics skill you can reach the loft. You can use the floating paint brushes glitch. With timing and patience you can use a Telekinesis spell to get the note. You can get a substantial boost in Acrobatics with the Boots of Springheel Jak, but any Fortify will help. A well-placed area-effect destruction spell (such as Shocking Burst, or even Weak Fireball) can knock the note to the floor. When you have purchased the display case upgrade, jump from the leftmost one (facing the windows) and you can grab the note while falling toward the loft with no acrobatics skill. The note contains a riddle: "Two bodies have I, though both joined in one. The more I stand still, the quicker I run." From reading the note, you get the impression that there is a treasure in an hourglass within the house somewhere. It may be difficult to find as there is no real clue in the note as to where it exactly is, and, if you have bought upgrades there are 2 normal hourglasses in the house in desks, which may confuse you. To find the treasure, go down into the basement, it's embedded in the top of the frame of the wooden pillar with the garlic hanging from it. Activate the "Old Hourglass." This completes the quest and you will receive an hourglass, the Ring of the Gray and 6 flawless gems: 2 diamonds, 2 sapphires and 2 emeralds. The riddle is an allusion to one of the riddles in Arena, which read the same. The answer was also "hourglass". If you just read the note the first time and forgot to pick it up, you won't be able to read or pick it up anymore. Similarly, if you drop the note, you can no longer pick it up. However, if you put the note in a chest you can retrieve it. 10 I've discovered an old, dusty parchment in an unused part of Rosethorn Hall. I doubt that it's been disturbed in at least 200 years or more. It tells of a treasure located somewhere within this place. If I can answer the riddle, I may know what I'm looking for. 100 1Yes Inside a battered hourglass, I've discovered a ring and several precious gems. This must be the treasure of Rosethorn Hall. It is possible to use the console to advance through the quest by entering setstage HouseSkingradQuest stage, where stage is the number of the stage you wish to complete. It is not possible to un-complete (i.e. go back) quest stages. See SetStage for more information. Esta página foi modificada pela última vez à(s) 02h09min de 29 de agosto de 2013.